Maybe, but why do I feel this is "You can't block me, I'm blocking all of ya'll!" ToroidalBoat, YamchasOnlyFan and Very Honest Content like this. In the midst of Twitter Block Boogaloo, Chris mixes apple and berry Fanta, and calls it "applrry." Sparklemilhouse, Skeletor and Very Honest Content like this. Call it want you want to, I call it apathy. king kong... with wings?, YamchasOnlyFan and ToroidalBoat like this. welp, chris beat my 12 hour prediction. His account's still protected. and from what I'm seeing on KF, it looks like chris has locked himself in a room full of wolves. Or in his case, potential new Idea Guys. EDIT: someone on KF brought this up: If chris's tweets are protected its going to hurt future E-begging attempts. He can still make YT videos but that's about all he can do to address the public. HotaruThodt, ToroidalBoat and Very Honest Content like this. Is anyone keeping a running count of how many people he's blocked? You mean how many people he has alienated? That's pretty much anyone who isn't CWC or Barb. HotaruThodt, Very Honest Content, Minimal Effort and 1 other person like this. I've been keeping an eye on KF, I'm surprised we haven't had any leaks yet. Minimal Effort, ToroidalBoat and Very Honest Content like this. I'd like to see how the madness continues. All I saw yesterday. Retweeting from Chris is no longer allowed it seems? Also Twitter blocks all the gifs Chris posts so I'm just gonna assume I shouldn't click on them. EDIT: TURNS OUT THERE WAS THIS GEM HIDDEN BECAUSE OF MY TWITTER SETTINGS. And no i don't know how to fix my twitter settings. Trefoil Knot, Very Honest Content, QuiltGuilt and 2 others like this. if you click on them they'll show, but you can change your account settings to see images by >Settings and Privacy >Privacy and Safety >Display media that may contain sensitive content. Twitter's set up to protect snowflakes. You can see you can mute replies/tweets by words in them, so chris could censor his incoming 'harassment' quite easily. and chris giving up on his red spy OC by replacing it with a new one? Seems weird for his 'toons are real' narrative but we know its stretchy as taffy. 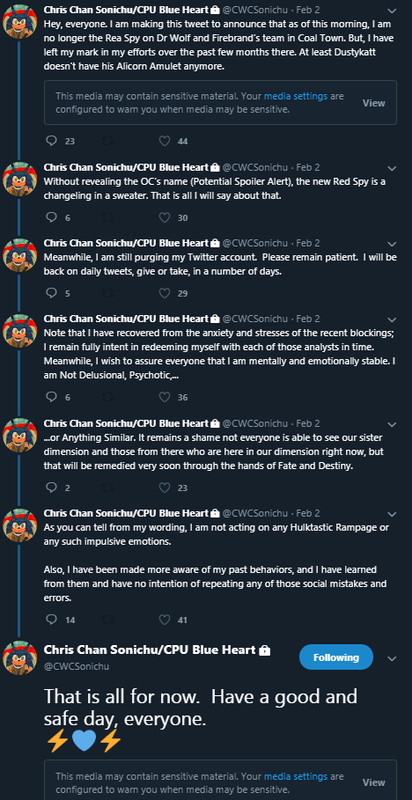 It almost says that he's trying to detatch from the bronies but he's saying he's still trying to apologize while having his account protected so only followers can see his tweets. Either he's made a new account and dicking with the bronies or he's WORKING ON IT. Come to think of it, if the captain or whatever tard wrangler is in charge of chris's account that may mean these sock accounts are chris unfiltered and unwrangled. You know who else liked purging? Stalin. "I am not acting on any Hulktastic Rampage or any such impulsive emotions." HotaruThodt, One Too Many, Very Honest Content and 3 others like this. So, there's going to be a shooting with Bob's gun in the theater showing a premier of the Sonic movie in C-ville this year, isn't there? That MIGHT be enough to get him in prison this time... but we all kinda know he'll just get a fine and another stint in anger management courses. But not before a dozen or so continuances. Minimal Effort, Very Honest Content, QuiltGuilt and 1 other person like this. I'm still not blocked. I guess Chris either has stopped purging their followers or somehow I was decided to not be blocked? QuiltGuilt, Trilby and Minimal Effort like this.